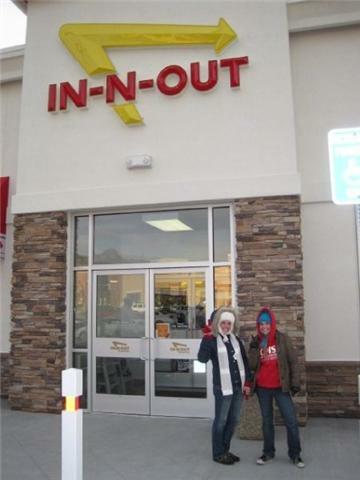 As soon as Kelli and I heard about the opening of the In N Out's in Orem and Draper, we were determined to be first in line on opening day! We planned for months and months and finally the day came! I wrote the details of the stay in a letter to my brother who is serving a mission so I will copy and paste it here so I don't have to type it all up again! This is our In N Out story!! First of all, Kelli got SICKKKK the day before the opening! AHHH like so sick! She was vomiting and passing out and had a fever blah blah blah. Tom and Mark gave her a blessing but we were pretty sure we weren't going to be able to go because she was seriously so sick! But by Thursday she was feeling better and so WE WENT. So we thought that if we went around 12, it would be plentyyy early so we packed up everything and got to the Orem in n out around 1230...BUT THERE WERE PEOPLE THERE. Like five people in line and then a car in the drive lane (he got there at 4am!!!) we were soooo mad and really sad. i was seriously about to cry because we had been looking forward to and planning this for soooo long! and we were all hyped up and then LET DOWN. anyway we sat in the car for like ten minutes debating what to do. i just couldn't drive away. it was too sad. then we saw that kelli's friend, anthon, was in LINE! so we started talking to him and then we got in line behind these people just to wait to see if we could talk to a manager to see if we would be able to get on BTV...because let's face it...that's all we cared about. Anyway we waited for like an hour and finally talked to someone named Stacie (who apparently you know). WE HATE HERRRR. She thought she was soooo cool and we were asking her questions and she wasn't even listening and like answering them wrong and acting like we were stupid. example: kelli asked when they were going to start building the in n out's in tx and stacie was like "we don't have any in n outs in tx, hun." (duh!!!) kelli: yeah but you own land lots there. stacie: we have lots everywhere, hun. JUST ANSWER OUR DUMB QUESTION YOU IDIOT. then kelli said something about how in n out originally was planning to move to tx then decided utah first for the whole chadders issue and she totally misunderstood what we were saying and goes "this isn't our first in n out in utah, hun (she says that a lot). we opened one a year ago in washington city. us: WE KNOWWWW OKAY!? WE KNOW EVERYTHING ABOUT IN N OUT. except we don't know when they are moving to tx but apparently neither do you. we hate her. we think you probably hate her too. okay so anyway we're just so mad because of people being in line in front of us and because of dumb stacie then the guy who was first in line suggested we drive to draper (where the in n out was also opening on thursday) and see if there is a line there and if there is he would save our spot in line at orem but if not we could stay there. great IDEA. we went. and YAHHHH WE WERE FIRST. we were soooo excited. we were like jumping up and down and screaming. the associates were all so shocked that we were there so early (orem is just a college town and lots of college students wanted to stay the night...). anyway we got so much freaking attention. everyone was talking to us and wanted to take pictures with us. everyone pampered us like crazy! this guy named joel (we don't really know where he ranks in in n out) gave us a bunch of free stuff. well, two things. cool keychains that have burgers, fries, and drinks on them and then a black and red lanyard that says in n out on it. we met like all the managers and all stars and everyone important basically. SO WE STARTED THE WAIT. oh this was at like 1pm by the way. i think i must have timing wrong somewhere...there is no way we got to orem at 1230 waited for one hour, drove half an hour to draper and were there by 1. hmmmm. :/ ANYWAY we played friends trivia, searched an i spy book, chatted about how FREAKING EXCITED we were, talked to all stars, talked about how annoying stacie was/is, talked about BTV, all that stuff. PS Stan was all-starring! cool huh!? kelli wants me to say he looks like a toad. okay so then they had the VIP party at like six and we were waiting outside in the cold (27 degrees) and someone inside was so nice and thought of us and sent an associate out to ask us what we wanted to eat! YAHHH free food TWICE. this was my first burger in six months and kelli's in 2 months. aww poor you. you haven't had one for over a year. bummer. anyway, we got one. and it was YUM-MY. around 730 some man came to campout and he could not stop talking about how he came at 10 that morning and thought about setting up his tent and then leaving because he had to go to a meeting in salt lake then decided that wouldn't be fair (yeah would not have been!--you set up your tent then are gone all day?! that is SO cheating!!) anyway he seriously wouldn't shut up about how he could have been first. then he would ask us questions about in n out then start talking to people in line at the VIP party like he knew what he was talking about. really all the information had just come from us 2 seconds earlier. like he told people about burger coins (which he had no idea existed until we said so) and "superstars"...idiot they're ALL STARS. oh and THEN after the VIP party WE SAW MARK FREAKING TAYLOR. bahhhhh! 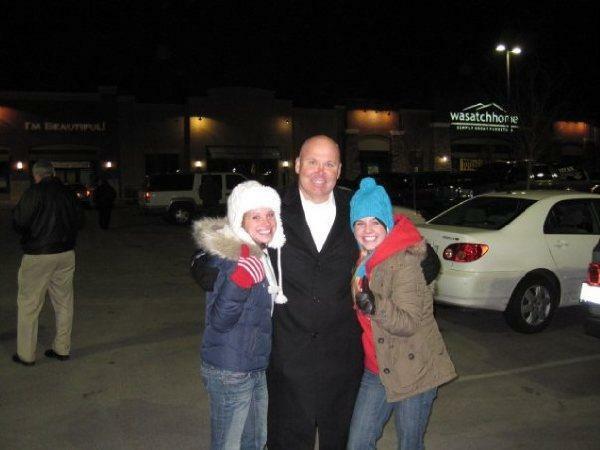 so we were so excited so we ran over to him after grabbing the camera and were like "mr taylor mr taylor! can we have a picture with you?! we LOVE you!" he let us. we took the picture. CLICK. then the annoying guy runs over with us and after our picture asks mark if he can have a picture too so of course mark says yes and during the picture AG (annoying guy) like wraps his arms totally around mark's waist for a pose (what a freak)! kelli and i went back and were laughing at how dumb he was then he comes over and goes "so who was that guy?" HAHHAHAHHAH. you idiot! why the heck did you want a picture with him if you don't even know who he IS?! so we told him then he calls his friend who is joining him later and tells him all about how excited he was because he got a picture with the president of in n out. "hey ag, you're gay." that's what we wanted to say. we didn't. at least not to him. so then after the vip party two different groups of associates brought us hot chocolate!!! mmmm. they all loved us so much! (only me and kelli really though...everyone wanted pictures with us and could care less about the other people) just the way we like it! :] then we got into our warrrrm sleeping bags and basically talked about how much cooler we were than the rest of the people in line (especially AG). He kept saying how cold it was going to be and how we should use one of his extra tents (he said he had like 25 extras...what the heck?) and we kept saying it was only going to be 27 which is cold but no wind so really a tent makes little difference. he kept saying how it was supposed to be 20 not 27 and we were like "we actually just called someone a little while ago to check the weather. it says 27." then he just kept saying how that was wrong then his friend comes and says "did you know it's going to be 27 tonight, man?" and then AG goes "yeah." hahahhahhaha NO you did NOT KNOW THAT. then he goes on to say how we should still use the tent because it gets the coldest when the sun rises and he explains why...but we didn't really listen. oh. and then this guy was mormon and drank COFFEE. hahahha. dummy. and he swore all the time too. typical utah mormon. so then we slept. 5 hours approximately. 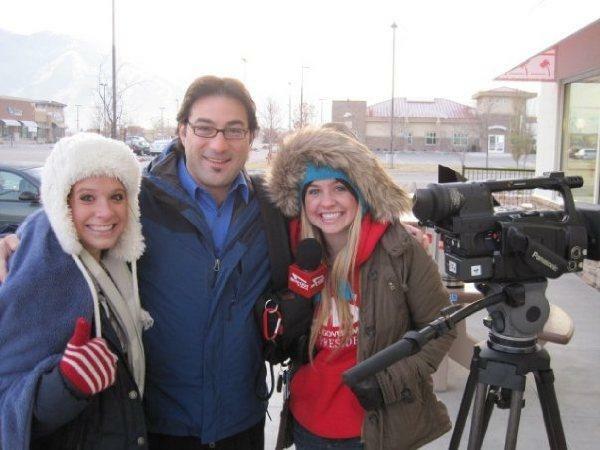 then the news stations came at 515 to record us. there were three stations and we went live on all three and then did interviews and some of those were aired later in the night. i wonder if you can follow this link?? http://www.ksl.com/?nid=148&sid=8730168 here we are! AG is in this video too. he's the one who talks about converting to in n out. oh and he made that joke like 50 million times. OH YEAH. wednesday night we got a btv interview and gave a shoutout to 122! we cant wait to see if they kept it in! okay we have to hurry kelli has to go home...so then we were interviewed again by BTV in the morning (just me and kel) and we got to say "WELCOME TO BTV!" we were so freaking excited! we did it perfectly! it sounded just like it should. the cameraman loved us because we loved him..A LOT. hahha and he knew we were obsessed with being on BTV. Then they let us go inside around seven so we didn't have to be out in the cold anymore. carl vanburen (the vp) who was like our best friend gave us each a burger coin and said "i know they'll be giving you guys all some later but i wanted you two to have these." then he had to go to orem in n out. YEAHHH BURGER COINS. then we got the big interview with BTV with everyone. well not really an interview we just stood there while the store manager said some stuff then we all said welcome to btv. except everyone else put the emphasis in the wrong places. dummies. then we got free tshirts! they're SO COOL! oh and we got beanies. then we each got a burger coin again from the store manager (YEAHHH) and THEN we were the first customers and got our yummmmmyyy food! oh and the news stations followed us while we ordered and ate. we were like the main story since we were there so long and to everyone were like two little girls who stayed the night alone. hahahha. it was soooo much FUN. you should definitely do it sometime. hahaha. everyone was so nice to us!...we were so popular! oh! and they're going to give us a copy of the BTV clip! yahhh! oh and we met kau (it's pronounced cow...remember him??) he said he knew you. okay we are attaching pictures. THATS ALL. WE LOVE IN N OUT. YAHHH. 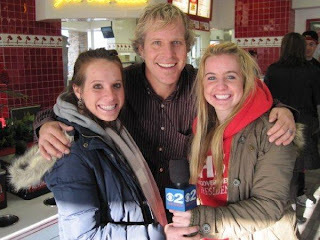 BTV stands for Burger Television and is an inside network that is shown to associates during In N Out store meetings. It talks about the latest things going on with In N Out (like store openings) and always has things that associates need to be aware of (like changes in policy, etc.) or reminders (like remember the tomato needs to cover the whole bottom bun). Stuff like that. Anyway, it's like amazingly cool if you get to be on BTV so that was really the main reason Kelli and I wanted to go. We have accomplished at least one life goal: be on BTV. Yay us! All Stars are In N Out associates who come from stores all over the west coast to help out at store openings. Some of them are permanent all-stars and they travel from one store opening to the other, always living in hotels. Most are regular associates who go to one or two store openings for a few months. Our brother, Ryan, did this once for a store opening in AZ. It's a pretty cool gig because you work about a million hours and get more than your regular hourly wage plus you get paid for LOTS of overtime. this is carl. he is somehow high up in the In N Out world. this is us. that is in n out. this is an all-star. she wanted a picture with us. this is MARK TAYLOR. VP of in n out. 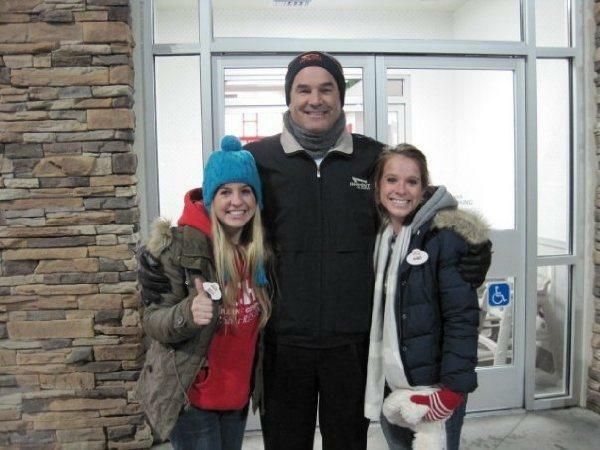 we were SO excited to meet him! getting ready to go to bed! In the morning, Kelli got a cheeseburger animal style, no pickles, light lettuce and extra spread. I got a cheeseburger animal style no lettuce no pickles add ketchup and mustard extra grilled onions and extra cheese. we shared a fry...with spread...and k got a chocolate shake. mmmm mmmm.